The new iPad will sport a front-facing camera – and there is little doubt about it – but where exactly will this camera be placed? Will it be towards the side like the iPhone 4? Will it be landscape like the XOOM or Streak 7? With the help with some friends with access to iPad 2 screen protector inventory, it appears the iPad 2’s front facing camera will be right at the very top of the glass. That’s also what the Reuter’s eyewitness said at the launch of the Daily iPad newspaper. 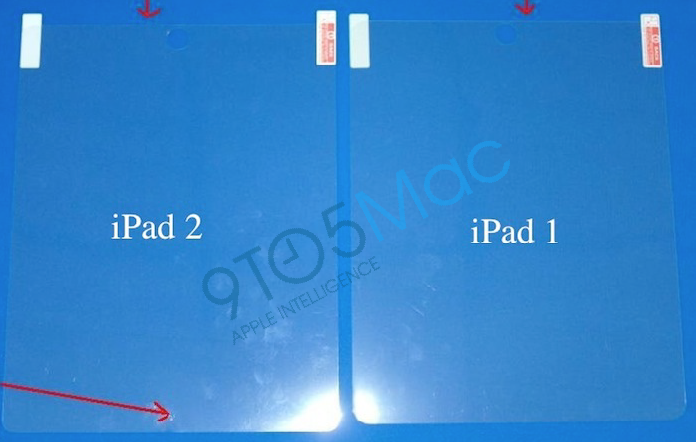 Also, another shot of an iPad 2 screen protector sent to us from a separate source seems to indicate that the the iPad 2 could possibly be slightly taller and slightly narrower than the current version of the iPad. The SDK has told us that the new iPad will have the same 1024 x 768 display as the current model, so does this mean a very-slightly-narrower bezel? A Smart Bezel, SVP?